Transcenders speaks to, for and about America's fastest growing demographic: those who are living without religion. Jonathan J. Prinz's career and thinking evolved over the years, from when he was an active rabbi serving a large urban congregation through his long and distinguished career as a branding consultant. Building on both a foundation of learning and a multifaceted life's experience, he takes a fresh and critical look at religion — why so many are leaving it behind. In America, where religiosity is the assumed default, 50 million people live without or beyond religion. Their being branded nonbelievers bespeaks a pejorative judgment. Meant that way or not, it implies individuals who have no beliefs. Nothing could be further from the truth. 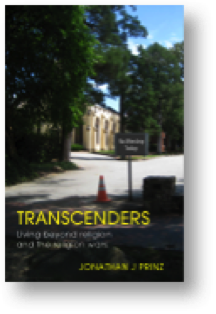 Transcenders: Living beyond religion and the religion wars, is written for and about this fast growing but largely dismissed and neglected minority. While telling a compelling story that is sure to resonate with many, Prinz seeks neither to proselytize nor to dismiss the religious. Transcenders speaks with conviction, but rejects out of hand the notion that anyone possesses the truth, a claim often made by both followers of religion and by their atheist counterparts. Transcenders is available in hard copy on Amazon and as an e-book there and at iBooks. The Kindle edition can be read on most digital devices with and Kindle App. Don’t have it: download the free Kindle app.